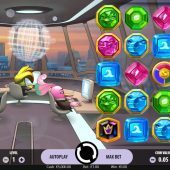 Wild Worlds slot by Netent is a cross between cartoon and fantasy featuring cascading tiles and weird creatures while we play to metronomic beat music. The grid lies over a glass control tower above a sinister looking city background with 3 bird characters all keenly eyeing their computer screens inside it. This is Netent's answer to the successful Play'n Go 5x5 cascade games like Moon Princess, Viking Runecraft and Energoonz, so can Wild Worlds make a world of difference to our bankroll here? There are 25 separate cascading tiles here on Wild Worlds slot with a 5x5 layout for which you pay 20 coins a play and you need 3 or more in a line horizontally or vertically anywhere. When you get a win, the tiles are removed to be replaced from above. The 5-of-a-kind wins are 100x bet for either the Wild or High Win (game logo) symbol. There are three Hero symbols all paying 15x for Green, Blue or Pink and three low-paying symbols all paying 4x bet and are again Green Blue or Pink. There are scatters for free games on all reels but there's a fair bit to see before we get to those! In the control tower there are the 3 Heroes which are represented by Bird characters of those three colours mentioned above. Randomly they may remove all the tiles from the grid apart from those of their particular colour and the Wilds, to increase chances of a win. The second modifier is that when you get a Hero win, all incidences of that colour Hero not involved in the winning lines turn Wild for the next cascade. Unused Wilds remain on the grid for the next cascade too. If you see three or more wheel scatters after a game is over, you get 8 free games. There will be a wheel that decides which of 3 modes you'll get, corresponding to one of the three worlds. All worlds get a Captain and Boss displayed by the grid where wins will accumulate power points for the Captains to destroy the boss with, which will then award Wild enhancements. Ice World - when the Boss is destroyed, you get a double Wild stack placed on the grid and it will remain until it doesn't form part of a win. Fire Lands - when the Boss dies, 2 to 4 random Wilds are placed on the grid. Dark Forest - a spreading Wild is placed on the grid and explodes if part of a win. New adjacent spreading Wilds are then created next to where the win was removed. You also see the three Heroes on the left of the grid during all free games modes. When enough wins of their colour have charged their meter full three times, they will then activate a special Hero Attack on the new monsters above them which appear after the first Boss is destroyed. These can be 1 damage point to all the monsters, 4 damage points spread over various monsters and 4 damage points to one monster. The monsters are of 2 types, Captains and The Boss. 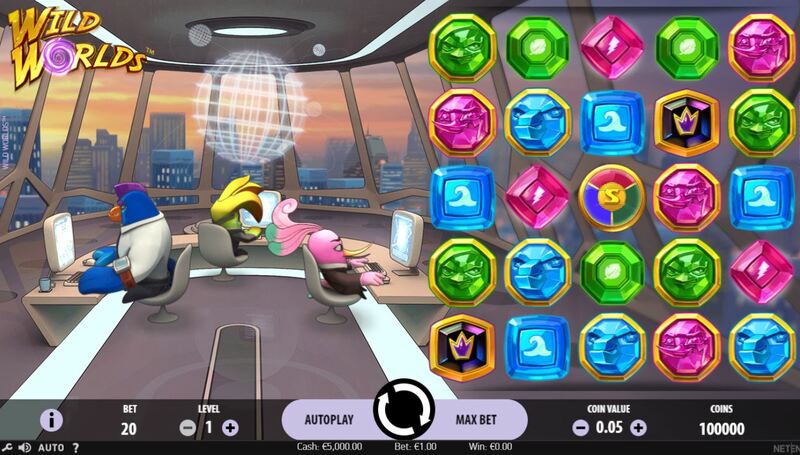 Destroy a Captain and get an extra free spins enhancement, destroy a Boss and you get taken to a different free spins world for another retrigger of 8 spins. It sounds complicated but is easy to understand when you watch it unfold and quite fun!